Bustards, considered the flagship grassland species, represent the health of the grassland ecology. With rampant hunting for the birds and declining grasslands in the country, their population also kept dwindling. 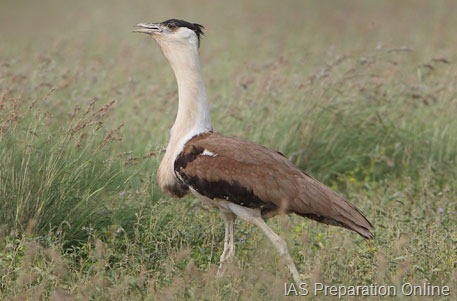 The Great Indian Bustard can weigh up to 15 kg and grow up to one metre in height. Its population decreased from 1,500-2,000 in the 1980s to 250-300 last year. Similarly, only less than 350 Bengal Floricans are left in the country and less than 2,500 Small Floricans survive in the world with breeding restricted to Gujarat, Rajasthan, Maharashtra and western Madhya Pradesh. The Great Indian Bustard, the state bird of Rajasthan, was earlier found throughout the western half of India, spanning eleven states. The bird is now restricted to only fragmented pockets in Rajasthan, Andhra Pradesh, Karnataka, Maharashtra, Madhya Pradesh and Gujarat, with very little breeding population. The Bengal Florican, which was once widely distributed in the Gangetic and Brahmaputra plains, is now found in pockets in Uttar Pradesh, Assam and Arunachal Pradesh. The Lesser Florican, the smallest in the bustard family, was found throughout the country. While about 75 per cent decline in the Great Indian Bustard was observed within a timescale of last three generations (40-45 years; each bird has a life span of 12-15 years), the governments did little to save the bird. The International Union for Conservation of Nature (IUCN), during the World Conservation Congress in 2004, had passed a resolution urging the Indian government to start a “Project Bustards” to protect all the bustard species in the country. The National Forestry Commission of India, too, in 2006 had recommended such a project on the lines of Project Tiger and Project Elephant to protect the three bustard species and other grassland flora and fauna. “Project Elephant and Project Tiger have shown that by targeting rare and flagship species, many habitats and associated species can be saved. However, there are many species that are not covered by these two Central government schemes,” said the report of the commission. As protection of grasslands would greatly benefit livestock, the Ministry of Agriculture and Animal Husbandry should also be involved in Project Bustards. However, neither the state governments nor the Centre could finalise any substantial plan for bustard conservation. “Since bustard does not have the status of a popular species in the people’s psyche, it has not received the attention of the governments as in the case of the tiger or the elephant,” admits an MoEF official. Even while choosing the national bird, the Great Indian Bustard was ignored in favour of the peacock. Conservationists had strongly pitched for the Great Indian Bustard. However, officials picked the peacock because of its more attractive looks; the fact that the word bustard rhymes with a swear word also weighed heavily against the large brown bird. IUCN categorised the Bengal Florican as a “critically endangered” species in 2008. Following this, a task force was constituted by the environment ministry in 2009 to look into the conservation of the bustard species. But little came of it. It was only after IUCN categorised the Great Indian Bustard as “critically endangered” and Lesser Florican as “endangered” species in July last year that the government began quick deliberations with wildlife experts and civil society groups working on the conservation of the bird. In November last year, the ministry organised a workshop with state forest departments, wildlife experts and non-profits to formulate the guidelines for a recovery plan of bustards. The draft recovery plans for the three species are the outcome of the workshop. Under the programme, the Centre has prepared the general guidelines for the conservation of the birds while states have been asked to prepare state-level and site-specific action plans. The programme is focused on securing the habitats for the bird outside the protected areas by involving communities. “The results of the ongoing programmes were not producing encouraging results as a sizeable population of bustards thrive in non-protected areas. Now, our thrust is to go beyond the protected areas and involve people in the conservation efforts. A major component of the plan would be to incentivise the farmers and communities for successful breeding of the birds on their land,” says Jagdish Kishwan, additional director general of forests (wildlife division) in the ministry. He also headed the task force on bustards. The Centre will give financial assistance to the states through its Integrated Development of Wildlife Habitats Scheme, initiated by MoEF in 2009. When Project Tiger was started in 1972, there was a campaign in the states to create protected areas for wildlife. Over time, nine sanctuaries have been notified for bustards. “However, these notifications could not produce the desired results as hardly one per cent of the grasslands of the country are covered under them. The government had no policy for conservation outside the protected areas. Consequently, rest of the grasslands were overgrazed, converted into agricultural lands or used for expanding industrial zones and human habitations,. Not only the governments, the bird also suffered because of the apathy of people. In July last year, the Maharashtra government decided to reduce the size of the Great Indian Bustard sanctuary in Solapur district. The sanctuary has around 25 of the birds, spread in 8,496 sq km. The government decided to reduce it to 1,222 sq km because some areas were already urbanised and residents in other areas complained that the irrationally large sanctuary was hindering the region’s development . Similarly, due to enhanced protection and restricted livestock grazing in the Karera Bustard Sanctuary in Madhya Pradesh, the black buck population in the area exploded, resulting in crop depredation in adjoining private agricultural lands. This antagonised local agro-pastoral communities, whose members did not want protected areas near their homes. This eventually caused the local extinction of the Great Indian Bustard. 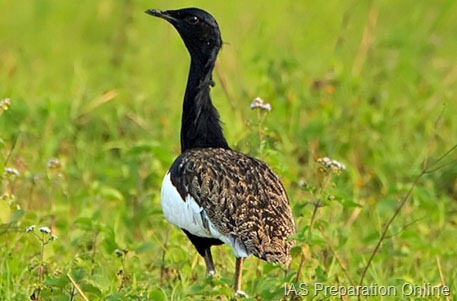 The bird is now extinct in three of the nine sanctuaries created specially for bustard conservation, including Karera. For this reason, the Bustard Recovery Programme recommends linking local livelihoods with bustard conservation. A profitable and equitable mechanism to share revenues generated from eco-tourism with local communities should be developed, say the draft guidelines of the programme. For effective conservation, the guidelines direct state governments to identify the core breeding areas for bustards and keep them inviolate from human disturbances. The guidelines suggest restriction on infrastructural development and land use diversion for roads, high tension electric poles, intensive agriculture, wind power generators and construction. Only low intensity, traditional pastoral activities should be allowed, that too, not during the breeding season, say the guidelines.